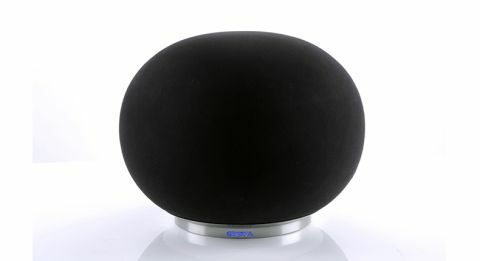 Geneva AeroSphere Large review | What Hi-Fi? It’s not often we find ourselves throwing our arms around a wireless speaker. But the Geneva AeroSphère Large is so big and so soft it leaves us with little option but to humour that impulse. We say big – Geneva certainly wasn’t joking when it labelled this speaker Large. At 40cm tall and wide, it’s not going to play the part of the unassuming kitchen speaker or bedside clock radio. The AeroSphère demands space to really show what it’s capable of – and our time with it tells us it absolutely deserves it. Underneath its soft domed exterior (available in a choice of black, white or red) is a cabinet comprising three separate acoustic chambers, which house an impressive driver set-up of two 2.5cm tweeters, a pair of 10cm midrange/woofers and an up-firing 15cm subwoofer, all powered by dedicated amplifiers. Geneva says the positioning of the subwoofer in particular makes the speaker less fussy about where you place it in the room. In terms of connectivity, the AeroSphère supports AirPlay, DLNA and high-quality aptX Bluetooth, plus has a 3.5mm input, meaning it’s pretty much compatible with any device on which you store your music. A large remote control is included in the box, finished in a rather fetching silver aluminium, and covers off most controls you’ll need for input selection, volume and playback in a spacious, easy to read manner. You can also control multiple AeroSphère products via the free iOS and Android app and create your own multi-room system of AeroSphères (the AeroSphère Small is available for £350), playing music together or independently of one another. There’s the optional AeroSphère Base (£450) too, which if added into your system, can stream CDs and FM/DAB radio over wi-fi to up to four AeroSphère devices. This app also helps with setup. Obviously if you’re playing back via Bluetooth then you just need to pair with the Aerosphère directly, but for AirPlay and DLNA connections you’ll need it on your network. Follow the instructions on the app to do so and you should be up and running within minutes. There are coloured LEDs behind the Geneva logo on the base of the AeroSphère that will light up to help you with setup and will also to tell you what source is connected, such as appearing blue for Bluetooth. As long as you can find a decently sized surface to house it, the AeroSphère Large will work fine just about anywhere in the house. We position it about 50cm from our back wall but the speaker configuration means you needn't be too fussy. For best results, we’d steer clear of placing it too deeply into a corner, but if you have to, the app has some EQ settings that will also help you find the right balance. Geneva suggest knocking the bass down to -6 for corner placements, and giving it at least 55cm of space from either wall if possible. Geneva’s app features a bold, modern design that’s clear and easy to use. Sources available appear in bold, black writing, with a volume slider along the bottom and icons of your Aerosphère speakers. In settings you are able to adjust bass and treble levels manually, or choose from three DSP settings for where your speaker is placed. You’re also able to rename your speakers to your liking. One downside is that you can’t access any DLNA devices through this app, and instead have to download a third party app, which is a bit of a shame – hopping between two apps doesn’t make for the most seamless user experience in an otherwise nicely thought out app. At £650, this isn't a penny pincher's choice, so we throw the AeroSphère in at the deep end with the second movement of Pyotr Tchaikovsky's Piano Concerto No1 in B-flat Minor as played by Daniil Trifonov and the Mariinsky Orchestra. And we are impressed. The pizzicato strings opening the movement are rhythmically spritely and set in open space that is soon shared by woodwind, brass and, of course, piano. There is more insight into each instrument than you might expect from a product like this, and a dynamic understanding that lets each part sing. As the texture builds, the AeroSphère doesn't seem to be in awe. Feeding each staccato note with decent attack, it also appears to have more space to give. Over six-and-a-bit minutes, we hear the kind of dynamics, balance and organisation we wouldn’t have dared expect from a wireless speaker at this price not long ago. It isn't quite at the Naim Mu-so's level, but nor is it in the region of the Mu-so’s £895 price tag either. At this level it has other competition, in the shape of the Naim Mu-so’s smaller brother, the Mu-so Qb and the Dali Kubik Free and it bests them both when it comes to insight and dynamic know-how. There’s stacks space to its presentation too, which makes mincemeat of tricky dynamic shifts and dramatic orchestral sweeps, plus there’s real scale here – this speaker sounds big at normal listening levels but push it loud and it will fill the biggest of rooms without ever sounding stretched. Changing musical direction, we test the AeroSphère with La Dispute's Hudsonville, MI 1956, and find electric guitars and drums are treated with the same insight and expressiveness of the Mariinsky Orchestra. The rhythms are there in Jordan Dreyer's vocal, so often toeing the line between lyrics and performance poetry, as is the expression; as Dreyer's tone switches between apathy and anguish in almost schizophrenic fashion, the AeroSphère is there ready to act as conduit. Switching it up again to Rihanna’s Work and the AeroSphère demonstrates a natural effortlessness and fluidity to way it flows over the song’s catchy melody. Once again, the level of insight here is second to none at this price and the transparency afforded to the vocals really allows us to pick out the fine detail and nuances lost elsewhere. The bassline is rich and full-bodied, punctuating the track with real weight and authority, but still offering up enough agility to drive the track forward with excitement and enthusiasm. This rumbling muscularity doesn’t stop the treble from shining either, with a smooth open treble that remains controlled and clear even at volume. The frantic cymbals in Foo Fighters’ Everlong never pick up a harsh edge or sound unnatural, instead sounding precise and full of texture. Even better, we find that whether playing over AirPlay or Bluetooth, the AeroSphère Large remains consistent, keeping its punchy, detailed and expressive character across both. We continue raiding our library, trying out everything from Frank Sinatra to FKA twigs. We tell ourselves we're testing the speaker's versatility, but in reality we're simply enjoying listening to the AeroSphère Large – surely the real sign of a truly great speaker. Put simply, this is as close to hi-fi as we’ve heard a wireless speaker get at this price – and even six months on from it winning our Award at this level, it is still holding its own admirably against newer competition. This isn't merely a victory for interior-design oneupmanship, Geneva has succeeded in bridging the gap between kitchen-top mini speakers and much more expensive kit, providing a truly enjoyable and talented performance to complement its huggable stand-out design. The AeroSphère might be large, but once you’ve heard what it’s capable of, we don't think many people would have trouble making space for it.